A lifelong Londoner, Henry Jutsum was born in 1816 shortly after the British defeated Napoleon for the last time and assumed a renewed leadership position in the world. As a pioneering industrialized nation, Britain’s economy in the early nineteenth century was significantly more stable than continental Europe’s war-torn regions, many of which were still primarily agrarian economies with little industrial technology. For the British arts community, this relative stability encouraged a measured pace of experimentation within the framework of the existing academic standards. Jutsum began his artistic education in Devon, where he may have had family, but then returned to Kensington in London to continue his studies. By age 14, in 1830, he apprenticed to the Norwich School painter, James Stark, who had just returned to London after a ten-year stay in Norfolk. At this time, Stark was midway through his publication on The Scenery of the Rivers of Norfolk, which would be completed in 1834; his illustrations for this project reflect the strong topographical emphasis of the Norwich School, and no doubt provided an important influence on the impressionable Jutsum. 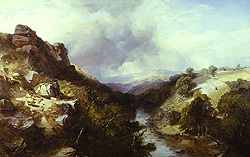 British landscape painting in the 1830s was at the peak of its influence—an especially propitious time for a young artist to establish his reputation in the field. With Stark’s guidance, Julsum would have absorbed the ideas and principles of the Norwich School, one of the first regional landscape painting groups in Europe. Led by John Crome and John Sell Cotman, the Society held annual exhibitions from 1805 to1833, emphasizing the importance of direct observation of nature. Like their better known colleague, John Constable, the Norwich School painters developed their images outdoors in front of the motifs they hoped to capture on canvas. The most important influences came not from the Italian and French classical traditions, but from the baroque schools of Dutch and Flemish landscapists, particularly Meindert Hobbema whose paintings were collected by many of the wealthy aristocrats and merchants of Norfolk. By the mid-1830s, Jutsum had begun to establish a reputation as a successful landscape painter. Although still quite young, he exhibited his works at the British Institution, a private art club, and presumably was able to attract the attention of the many collectors associated with that organization. At some point during this decade, he also seems to have become intensely committed to working in watercolor. The reasons for this remain unknown, but it is certainly likely that the work of John Sell Cotman, a leading member of the Norwich School, may have been an important influence. Jutsum participated in the Association for five years, working consistently in watercolor and exhibiting at the gallery at No. 38 Pall Mall. For an artist without other sources of financial support, watercolors offered several advantages. First, it was less expensive in terms of supplies, as well as an easily portable medium for a landscape painter who was often on the road in search of motifs. 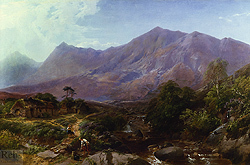 During the 1840s, Jutsum’s documented painting expeditions included trips to Devonshire and the Scottish Highlands, and it is likely that he traveled elsewhere in Britain as well. Second, watercolors were affordable to a larger market of potential buyers, which meant that a middle-class client who would not be able to purchase an oil painting might be tempted by a watercolor. After 1847, Jutsum returned to oil painting as his primary mode of expression. Again, there has been no research on the reason for this change of heart, but there is documentation of his participation in the 1851 exhibition at the Royal Academy, where he displayed Devonshire Coast, an oil painting that attracted positive critical attention. Perhaps Jutsum’s painting had become sufficiently marketable to provide him with a comfortable income. His popularity with collectors is also suggested by a hand-colored engraving of an earlier work, The Noon-day Walk that was published in The Art Journal in 1858. Jutsum’s achievements as an artist also allowed him to purchase a home in St. John’s Wood, one of London’s earliest suburbs. Developed in the 1820s as a residential district for “villa” housing, it was a very fashionable address, and a certain indicator that Jutsum was quite affluent by the 1850s. 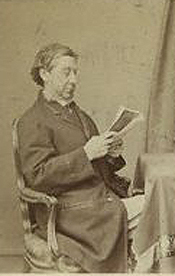 A carte-de-visite from the 1860s confirms this impression with an image of a well-dressed man seated comfortably in an elegant armchair. Henry Jutsum died in St. John’s Wood on 3 March 1869 at age 53. [i] Patrick Noon, Crossing the Channel: British and French Painting in the Age of Romanticism, (London: The Minneapolis Institute of Arts in association with Tate Publishing, 2003), 197. 'Published under the direction of the General Literature Committee' (London, Society for Promoting Christian Knowledge, 1905), 171-172.